In the run-up to their confirmed, February 25 unveiling, we’ve seen a trove of leaked info and images purporting to show Samsung’s Galaxy S9 and S9+. And while we know for the most part what to expect of the high-end duo from a spec, feature, and design standpoint, it’s reasonable to assume they’ll also boast some next-generation capabilities, which we probably wont learn more about until the company’s official press conference.. Well, not if famed serial-leaker Evan Blass has his say in it. Blass, who goes by @evleaks on Twitter, was back on Thursday for the second time this week with fresh details about the Galaxy S9. Earlier, Blass leaked a round of what appeared to be official press images of the S9 and S9+ adorned in Samsung’s stunning Lilac Purple color. 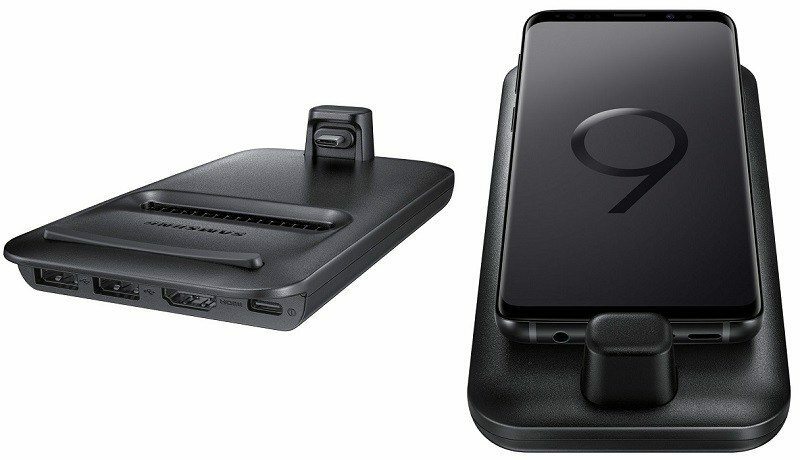 Late Thursday, he was back with yet another Tweet revealing one of the S9’s “most promising features” — err, accessories..
Last year, Samsung released its Dex Dock accessory alongside the Galaxy 8 and 8+, allowing those devices to dock — and connect via USB/HDMI — with compatible TVs or external displays, giving users access to the company’s PC-style Desktop Experience. For 2018, the South Korean company is expected to replace its DeX Dock with an all-new Dex Pad accessory, according to the leaked photos Blass published to Twitter. It’s a total sight for sore eyes, to be sure. But DeX Pad is clearly designed for features and functionality over anything else. The unit will allegedly boast familiar DeX Dock capabilities allowing users to “transform” their S9 or S9+ into a PC wannabe. Though, unlike its predecessor, DeX Pad will interestingly allow users to turn their S9 or S9+ into a mouse pad or keyboard during Android PC mode. DeX Pad will also include a wide range of ports to facilitate these capabilities, including HDMI, USB-A, USB-C, and, yes, even a 3.5mm headphone jack. Blass followed up with another Tweet later in the day, providing a link which leads to a DeX Pad ordering form on Tessco’s website. And though additional details including the unit’s price and release date weren’t revealed by the listing, Tessco says DeX Pad will be retroactively compatible with devices including the Galaxy S8, S8+ and Note 8.